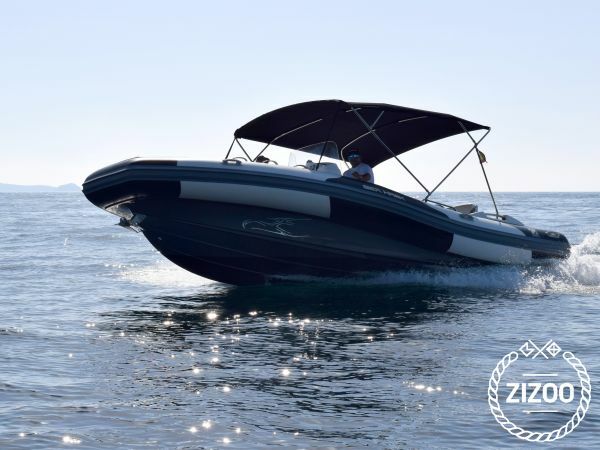 Greetings and welcome to the announcement of a great semi-rigid boat Zodiac Seahawk S700 that is available to the public for rent. It is a boat of seven and a half meters in length and has the authorized capacity for twelve people. The boat is equipped with a 250 horsepower engine and also has navigation material such as GPS, probe and a VHF radio. It is therefore a very safe boat, easy to handle and very stable. It was also acquired in the summer of 2012, so it is practically brand new. The boat is moored in the port of Santa Eulària des Riu east of the island of Ibiza. Place where are the best coves and beaches of the whole island, even has a small islet in its vicinity the Illa Togomago in which you can anchor to spend a quiet day without distractions of any kind. But, my special recommendation is to drive to the island of Formentera, because its crystal clear waters and incredible coves make it a wonderful place to which I insist that you have to go. The price does not include fuel, but 21% VAT is included.